The best way to get kids to eat healthier is to get them cooking in the kitchen. 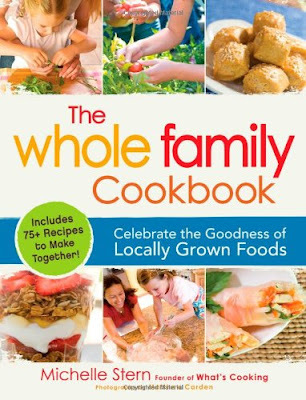 Whether you're already raising little sous chefs or don't know where to start, Michelle Stern's cookbook, The Whole Family Cookboook, has everything you need. Michelle, who is a personal friend of mine, is both the founder of the popular blog, What's Cooking with Kids? and owner of What's Cooking, a certified green company in the San Francisco Bay Area that teaches families how to cook more healthfully. 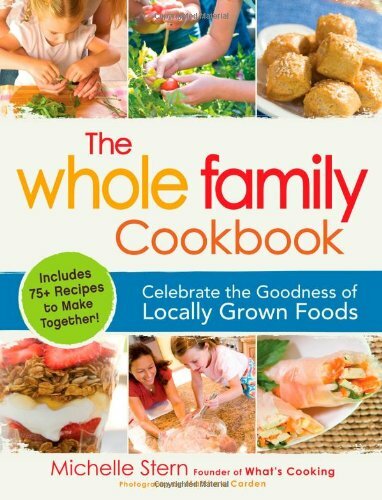 Now she has a cookbook with over 75 healthy, tasty, family-friendly recipes for you and your kids to whip up in your own kitchen. Chapters are divided by meal types: "Breakfast of Champions," "Lunchtime Favorites," "What's For Dinner" and "Scrumptious Sides." There are two extra chapters entitled "Mom-Approved-Treats" with recipes such as Apple Crisp with Vanilla Sauce and "Make-It-Yourself" dishes with recipes such as homemade pancake mix. Instructions are smartly color coded for children of different ages and many are accompanied by fun facts and trivia. While some recipes are clearly geared to kids, such as "Turkey Toes," a healthy riff on chicken nuggets, most will be happily eaten by kids and adults alike. What mom wouldn't enjoy Mashed Sweet Potatoes with Caramelized Apples or Cinnamon Pear Clafouti? *Think and eat like a locavore (a person who tries to eat locally sourced foods). *Engage your kids in grocery shopping and cooking. *Save time making home cooked meals. *Have fun cooking with your kids while teaching them important life skills. Since I love tofu, I made Michelle's recipe for Crispy Tofu Triangles with Asian Dipping Sauce. Whether or not you're a vegetarian, tofu is a healthy, tasty alternative to meat. 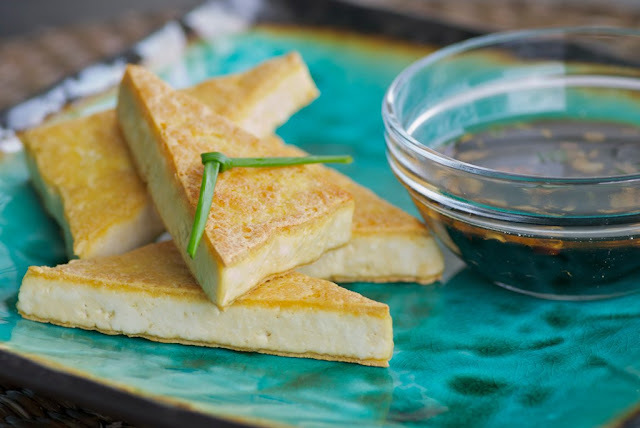 In this recipe, the tofu is cooked until golden and crisp then dipped in a sweet and tangy sauce made with honey, soy sauce and fresh chives. I don't have kids, but my husband who is most definitely not a tofu fan, liked it too. 1. Open and drain the packages of tofu and cut into slices approximately 1/3" thick. Cut the slices diagonally into triangles. Place onto towel in a single layer. Place another towel over the top of tofu slices and top with another baking sheet. Put something heavy on top to it presse the liquid out of the tofu. Allow to rest for 30 mintes to 1 hour. 2. Heat a heavy-bottomed skillet over medium-high heat and add the canola oil. When it starts to shimmer, carefully place the tofu triangles into the pan. Cook 2 1/2-3 minutes on each side, or until golden brown and crisp. Remove from skillet and drain on a plate lined with a dish towel or paper towels. Pat the tops to absorb the oil as well. 3. To make the sauce, pour soy sauce, sesame oil, honey and rice vinegar into a small bowl. Stir. Peel the paper off the garlic. Use a garlic press to mash the garlic, and add it to the sauce. Use clean scissors to snip some chives into the sauce, for color and a wonderful mild onion flavor. Note: I received a complimentary copy of the book for review purposes but was not paid. If you'd like to learn more about the book, check out Michelle's video. This sounds like such a great cookbook! I'm loving the sound of that sauce to go with the tofu...delicious! That sounds like a cookbook I need to own! Thanks for sharing the review! Absolutely love the sound of that tofu and dipping sauce Susan...this is the second time I've read about this great book. Am lovin' the sound of it! I am not a big fan of tofu,but this does look great. I actually just ordered this book! It looks like a lovely mix of kid-friendly-yet-refined recipes! Congratulations to Michelle on the debut of her cookbook - she is doing great work with kids and families and should be commended! How exciting! I really love finding cookbooks that are mommy and kid friendly. Sounds like we may share similar food/blogging philosophies. I can't wait to head over to her blog and check it out. I just made this recipe tonight, and we all loved it. So easy, and I love the tip about squeezing all the liquid from the tofu. My husband recently became a vegetarian, and he gave the tofu two-thumbs up (yes, real men do eat tofu)!! Is this your blog, too, or is someone stealing your pics?